Boli | Obbattu | Puran Poli | Holige | Festive Recipes & Onam Wishes !! Wishing all malayali's a happy and prosperous Onam,in advance !! I know all are busy making up the menu and planning on dishes to be served for Onam sadya.I truly miss the zeal in Kerala during Onam though the nostalgic Onam memories is faded out.I got to celebarte very less Onam in Kerala but the fond memories that my parents shared had been a dear one.Nowadays,Onam is left out to just dressing up in mundu (a long garment tied around the waist with a simple twisted knot,like a dhoti) and shirt for men,ladies dressed up in set saree/set mundu(a traditional Kerala saree).Many shops are on sale during this time with some big prizes and offers.There are many pookalam contests,payasam contests and games fun going on around.The rush in buses,trains for Onam is incredible too.And above all,the price of vegetable takes a hike as the vendors make the maximum profit this week.Shops and houses are well decorated with lights and colors.Kids are on a short break from schools for Onam holidays.Ladies and kids join hands to decorate the patio with flowers,they make designs with flowers(pookalam) which starts much before.The banquet lunch is the most awaited time of the day that I eagerly wait on Onam.Though these are just a few lines about the auspicious festival and I don't wish to set in boredom for many who actually know all about Onam.So,let me hope everyone rocks this Onam in a safe and joyful way !! Today's post is a festive recipe made in many southern states of India.So many names for one single recipe?? Sounds interesting right?? This is a recipe made in many different states with slight variations but the general procedure remains the same.Boli or Puran poli is a flat sweet stuffed bread like parathas but the outer covering is very soft and is made smaller than the stuffing.In some states sugar is added instead of jaggery.Some people add cardamom powder instead of nutmeg powder and the dal also varies with states.Toor dal or moong dal or a combination of both is also used instead of chana dal. The first time I had was obbattu(puran poli)as a child during our stay in Bangalore.One of our good neighbours presented us on one of the important festive days(I think Ugadi) and we all liked it very much.Then,mom jotted the recipe from the neighbour aunty and made at home which came out okay but not as good as the hers.Then,I had boli in some of the marriages in Kerala when they serve it on the ela(banana leaves) for sadya along with paal payasam.That definitely tastes heavenly when the boli gets soaked in payasam and we glob it down the throat(makes me drool as I write this now).This had been in my try list for so so long and finally got to try my hands on it.This is my fist attempt which was very good in terms of taste and softness as per my H and kids but I was disappointed at the irregular shapes(not perfect round except for one or two).Practice makes things perfect,may be next time I can do things better in terms of shape.I just made a small batch as I didn't wish to waste if things went wrong.I was very happy that it tasted so good and were very soft. PS:If you plan to make boli,make it on a free day as it definitely take time to get things correct.Also,read the notes before you make these.Also,let me clarify the fact that boli is prepared by dusting with rice flour not oil and sugar is used instead of jaggery(for authentic Kerala version).I have made puran poli(obattu) which is almost similar to boli except for the above two mentioned differences. FOR DOUGH- In a bowl,add flour,salt and turmeric powder.Mix well and add water as needed to knead in a sticky dough.Then,add half the oil mentioned(1/8 cup or 2tbsp) and knead the dough for about 6-7 minutes.The dough initially may look splitting in pieces when you add oil,but don't worry.Keep kneading and you may see the dough comes together as oil is absorbed until you get a soft pliable dough.Add the remaining oil(1/8 cup or 2tbsp) on top as a single layer and keep the bowl covered with a plastic wrap or lid.Leave to ferment for about 6 hours or overnight(atleast for a 4hour resting time is required to get soft boli,I left it for 6 hours). FOR COOKING DAL-Wash the chana dal(or toor dal) and then add to a open pan or cooker.Add 4-5 cups of water and cook over medium heat.Keep checking the dal in between;press a dal between your thumb and index finger and if it mashes easily then its done).Switch off flame and then drain in a colander or strainer(collect the dal water to add to soups or use for making chapathi dough or some people make obattu saru). POWDER THE DAL-In a blender jar,add the cooked dal and pulse it 4-5 times or blend without any water to get the powdered dal(powder it fine else the filling may seep out).To this,add *grated jaggery(refer notes),mix and keep aside. 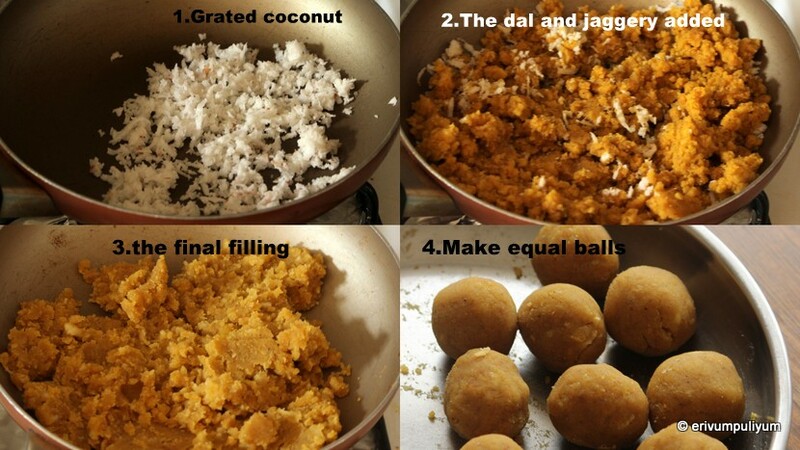 MAKING FILLING-Heat a pan and add the coconut and dry roast till the moisture is dried out.To this add the chana dal-jaggery mixture.Heat on low until the jaggery stars to dissolve and the filling comes together,don't dry the mixture completely.Switch off flame and leave to cool.Keep covered until use.Make ten equal size balls once it is ready to be stuffed(don't make the balls before hand as it tends to dry out and it will be difficult to spread the filling). FOR MAKING BOLI-Once the dough has rested for a minimum of 4-6 hours,then mix the oil with the dough that had been poured on top of the dough.Pinch out small equal ten portions(the dough can't be shaped like balls as its very soft and oily) and keep covered.Take one portion and place on a oiled ziploc bag/any transparent sheets/obattu sheets.Flatten lightly by your palm and place the stuffing in the dough(keep the remaining portions of dough and filling balls covered so that they don't dry up much),bring the sides together to seal.Add oil on top and cover with another ziploc bag or sheet.Using the palm of your hand,gently spread as much as you can.Add more oil if required so that it doesn't stick to the sheets and get the sides thinner(you can even dip the filled balls in rice flour instead of oil,give a nice coating with rice flour and roll using a rolling pin like we do for chapathi,saw a video in youtube where they show making boli like that).I preferred the oil method as I wasn't sure of the outcome.But for a less oil version,dipping in rice flour is good. Heat a non stick pan and when it is hot,gently transfer the rolled discs taking care that the sides don't fold back or the discs don't shrink(remove the top ziploc cover and using your right hand gently flip it from the bottom ziploc bag).Wait till one side gets cooked on medium flame and then flip the other side,cook again.Drizzle oil on the sides and top.Flip on a plate and continue with the rest of the prepared dough. Serve obattu/boli/puran poli topped with ghee/warm milk or paal payasam or semiya payasam(don't stack the prepared boli immediately,wait till its warm and then can be stacked). 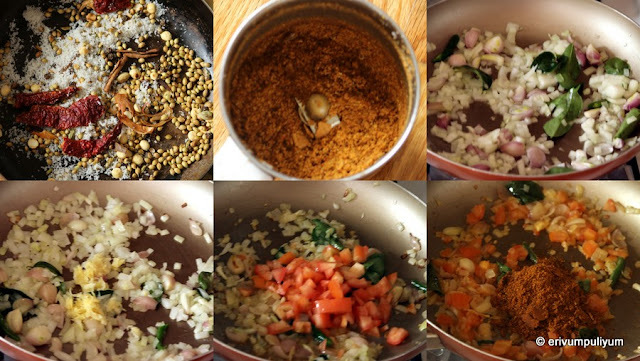 * I had bookmarked this recipe from here but I have slightly made changes in the original recipe and have used chana dal instead of toor dal as I love that taste more. *The dough should be kneaded for 5-7 minutes and should be rested for fermentation atleast 6 hours or overnight.I prepared the dough first and rested for 6 hours and in the mean time,prepared the filling. *I have used gingelly oil(nallenna) as it makes the dough softer.You can always use vegetable oil instead too. *Be generous in adding oil and don't reduce the specified amount,more the oil the softer it is. * I have used a mixture of both nutmeg powder and cardamom powder.I used 1/4tsp of nutmeg and 1/2 tsp of cardamom powder but you can omit nutmeg powder if you don't like the flavors. 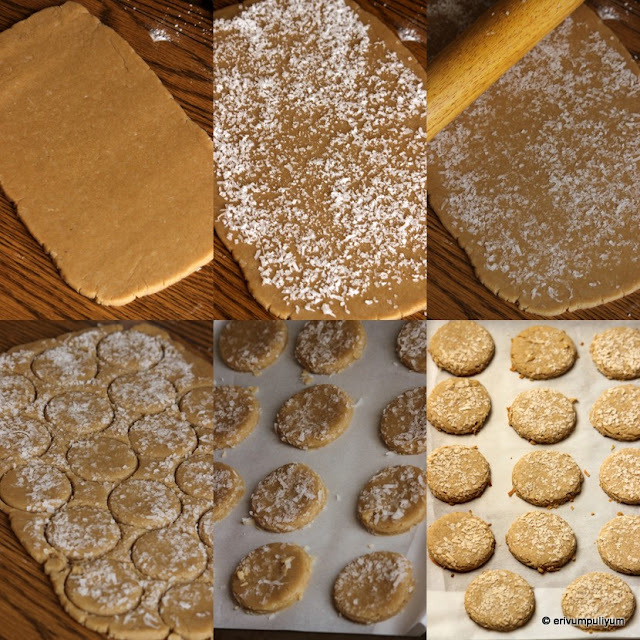 * You can even add a pinch of dry ginger powder to the filling if you love the flavors. * The jaggery that we buy here has no impurities once dissolved and strained and so I used grated jaggery.But if you are not confident of the impurities in the jaggery that you are using,then its better to dilute the jaggery in 1/4 cup water and then straining.Add the coconut to this strained mixture and let it get reduced on stove top.Finally add the chana dal powdered,mix well. * The grated coconut which I used had long strands and so I would recommend pulsing that too to get smaller strands before making the filling or try to grate fine.In some places,coconut is omitted. * The dough ball should be half the size of the stuffing that helps to get the cover thin and smooth.However the cover shouldn't be very thin nor very thick. *There are obattu sheets available in market to roll it out thin.I have used two ziploc bags oiled and that works fine too.You may even try using banana leaves which should work fine too. *Cook the boli on low medium flame as it may turn brown very faster and may not get cooked properly.Drizzle oil on the sides while cooking to get a neat glossy finish. * Don't stack the boli one above the other when hot.Wait till its warm and then stack to retain softness.Also,keep it covered. 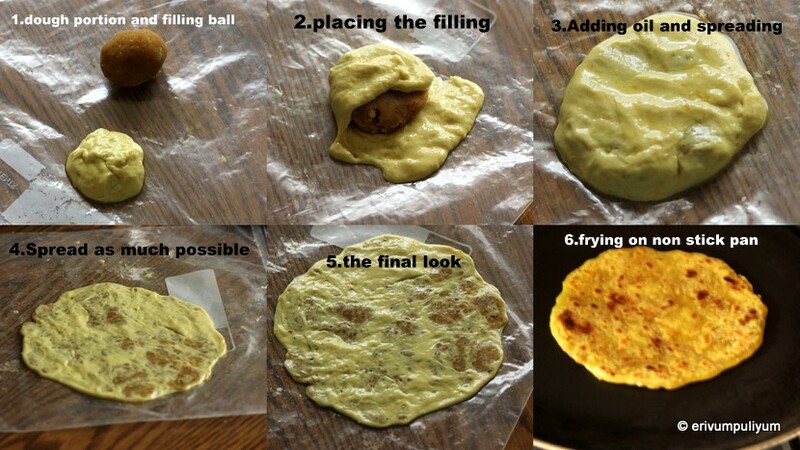 * If refrigerating leftovers,wrap in paper towel and store in ziploc bags.Refrigferation makes the boli hard and so a good steam cook is required the next day to yield the same soft boli and top it with ghee/oil. Enjoy !! 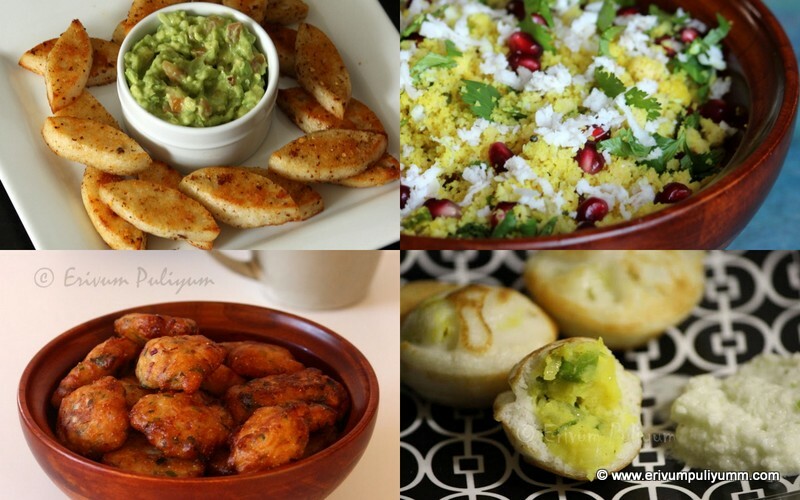 For all sadya recipes,click this link. Wishing all a blessed Onam once again !!! Cheera thoran (Spinach stir fry) is a healthy iron,vitamins and minerals packed stir fry.Its a simple side dish that can be served with steamed rice.Though I make this stir fry frequently but never tried adding jackfruit seeds to this until recently.The jackfruit seeds adds a nice crunch in between to the mushy thoran(stir fry).We bought a piece of fresh sweet jackfruit from store.But as a malayali,I couldn't resist the smell and the stares of the jackfruit,when I finally bought the portion and H was apprehensive about the taste and so wasn't favoring much.But to my surprise,the portion was very sweet and juicy and all had it.I and H decided to buy it again but never did I find again as the season is done.You can try this healthy stir fry with any greens.Do give this a try if you like it !! Wash the leaves thoroughly to remove any mud/dirt.Then pluck each leaf or go through each one to check any worm infestation or mashed leaves.Remove if any.Hold it as a bunch then,chop them.Leave in a plate. If you are using frozen chakkakuru(jack fruit seeds) then omit this step.You can just thaw and steam cook for 3-4 minutes and use.If using fresh ones,then remove the white thick skin.Inside you can see the brown skin of the seeds.Drop and soak them in water for half an hour.Scrape the seed to remove the brown coat as much possible.Leave any left overs and cut in quarters.Let it remain soaked till use.In a pot,add the jackfruit seeds(chakkakuru),turmeric powder(1/8tsp) and salt with 1/2 cup water.Let this come to a boil and get cooked.It may take around 10-12 minutes on medium flame(the cooking time may vary as per the dried jackfruit seeds).Drain water if any and keep ready. In a pan,heat oil and splutter mustard seeds.Fry the red dry chillies.Add the crushed garlic cloves,saute until raw smell disappears.Add in the finely chopped onion.Saute until translucent.Now,add the turmeric powder and chilly powder on low flame.Add in the chopped spinach leaves.Saute until it gets cooked(don't cover else the green color is lost).Add salt only when the leaves have wilted and reduced.Add in the grated coconut along with cooked jackfruit seeds.Give a quick toss and simmer for another 2 minutes.Dry out any moisture left and the stir fry is ready to be served with rice. * You can use any other greens other than spinach too to make this stir fry. * You can use fresh or frozen jackfruit seeds. 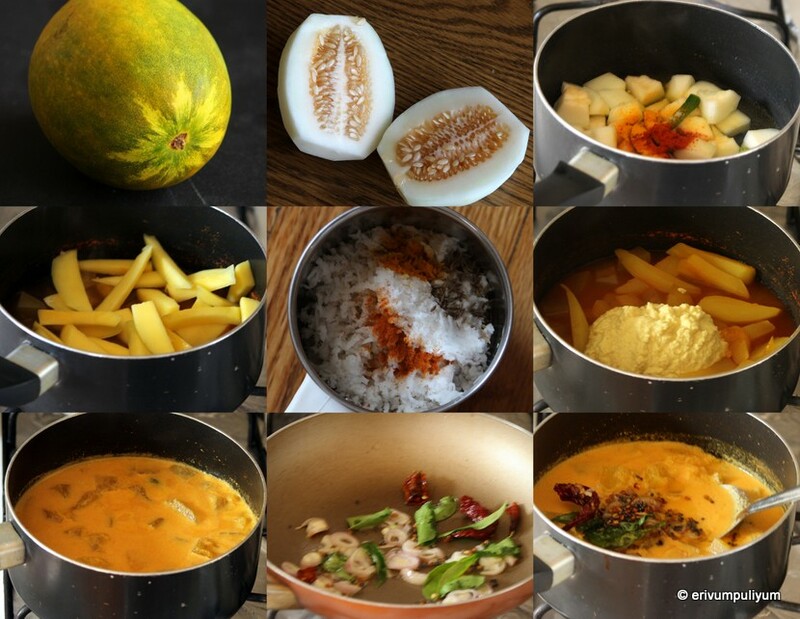 The traditional recipes have always inspired me more than any other dishes especially those that can be served with steamed rice(choodu choru).This is one such delicious authentic recipe from Kerala that goes well with rice.The raw mango slices add tanginess to the curry along with spice flavors.The flavors of this curry perfectly syncs with my web page name 'erivum puliyum'(spice and sour),hi hi..Thanks Dyuthi for the recipe,am glad I tried it and all loved it.The coconut paste adds consistency to the gravy and the cucumber pieces adds substance.The tanginess can be replaced with puli(tamarind) paste if you have no raw mangoes.Do try this curry in this Onam season,am sure your family will love it !! In a pot/pan,combine the cucumber pieces,turmeric powder,chilli powders,salt and water(2 cups).Bring this to a boil and simmer on medium flame for 8-10 minutes until the vellarikka(cucumber) gets 3/4th cooked.Add in the raw mango slices and mix well,add salt if required.Cook until the mango pieces are tender(about 5 minutes). In the meantime,grind the coconut with shallots,cumin seeds,turmeric powder to a smooth paste.Add this paste to the cooked cucumber-mango mix.Add half cup water to adjust the consistency.Simmer the flame and cook for 2-3 minutes until its gets well blended.Then,switch off flame. In another pan,heat oil and when its hot,splutter mustard seeds,fenugreek seeds.Add in dry red chillies,curry leaves.Pour this over the curry. *Tempering with coconut oil adds the authentic flavors but you can always use other vegetable oil or neutral oil. * I have used a mix of kashmiri chilli powder and hot chilli powder.But you can always use kashmiri chilli powder alone. 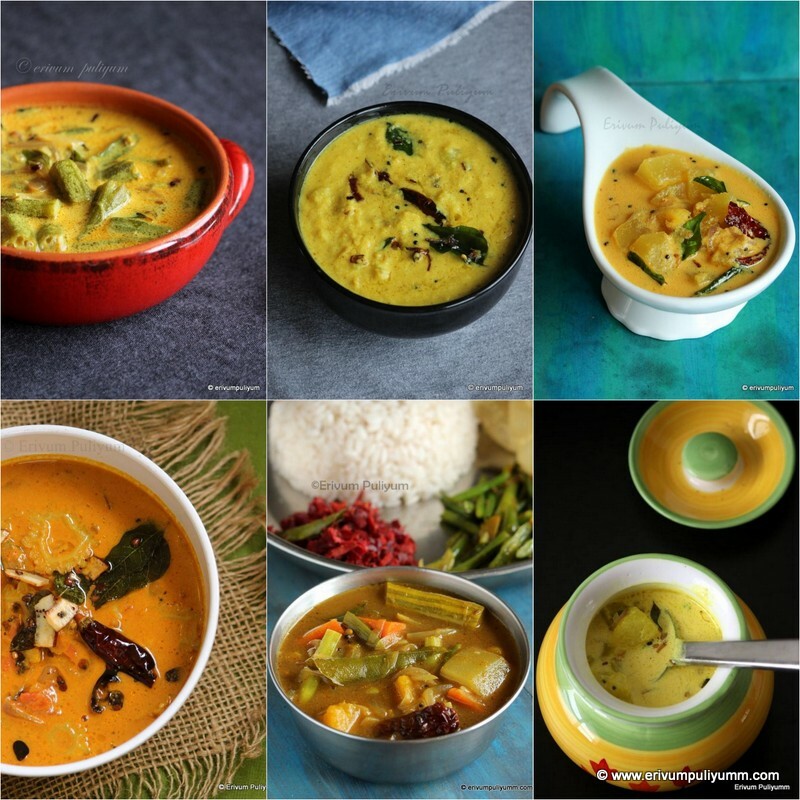 *You can even use ash gourd or raw papaya to make this curry.I have tried using that. * You can add 2tsp of tamarind paste instead of raw mango slices too. I love dipping crunchy cookies in chai(tea) and having it.How many of you do the same? ?I remember having these coconut biscuits as a kid and used to love them.They are really addictive and delicious with coconut flavors.The dipping of dessicated coconut at the top is optional as the cookeies have real could flavors without the topping too.However,the topping gives an extra crunch and flavor.This cookie was loved by all in my family.These cookies are made with wheat flour but you can always use all purpose flour(maida).In that case reduce the moisture content by reducing the milk or addiong milk little by little as required.Try these out and enjoy with tea !! Powder the sugar in a blender,measure and keep aside.Preheat oven to 350 degrees F/180 degrees C and line two cookie trays with parchment paper.Add the sweetened coconut flakes(for garnish) in blender jar and pulse two to three times to break down the long strands of coconut flakes,keep aside(If you are using dessicated coconut,then add a tsp of sugar in that,mix well and keep aside). In a clean bowl,sift the flour,baking soda and salt twice,keep ready. 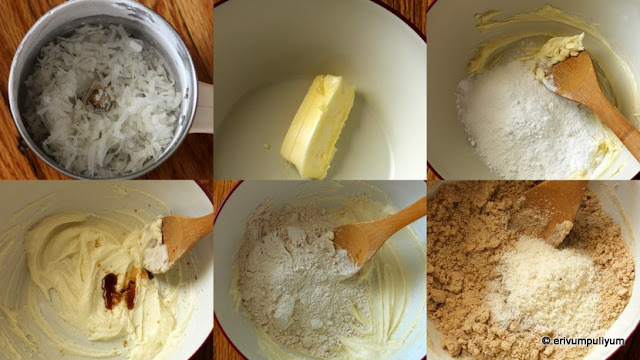 In another bowl,beat the butter well using a wooden spoon or spatula.To this,add powdered sugar and mix it well until creamy and off white.Add in vanilla extract and combine well. Now,add flour,dessicated coconut and milk,a tbsp each time till the dough starts to come together like a dough(I used 5tbsp of milk). Knead the dough well and if your dough becomes loose or butter starts to melt,then refrigerate the dough for half an hour(in that case,put off the oven until use and pre heat just before rolling out). I skipped refrigeration as my dough was firm and could be rolled out easily.Lightly dust the surface with flour and using a rolling pin,roll out the dough(the dough may be cracky at the edges,don't worry.Just using your hands or offset spatula,bring the sides together like to form a rectangle shape).Roll out evenly in 1/4" thick and then spread the sweetened coconut flakes on the rolled dough.Using the rolling pin,roll the sweetened coconut flakes gently so that it sticks to the dough and stays in place.Now,run a spatula under the rolled sheet of dough so that it becomes easy to slide the cookies on the parchment paper.Using a cookie cutter of 2" cut out the shapes in roundels,squares or any other.Transfer the cookies on the parchment lined tray and can be spaced closely as these cookies don't spread much.The scraps can be brought together and re rolled till you finish. Place and bake in oven for 15-18 mins(at 15 mins the cookies are ready but if you wish to have them crunchy then,give another 3 mins.Mine got ready at 18 mins).The bottom and edges of the cookies are slightly browned and the coconut on top looks toasted. Cool on wire rack and store in sir tight containers or serve with tea !! * The recipe is inspired from Vah chef's video but tweaked slightly by replacing wheat flour for all purpose flour(maida).I use ashirwad atta(wheat flour). * You can use all purpose flour too.In that case omit adding the baking soda. * You can add water instead of milk but I added milk. * You can use dessicated coconut for garnish too.In that case add a tsp of sugar to the dessicated coconut and then add to the topping instead of sweetened coconut flakes. Enjoy with your tea !! 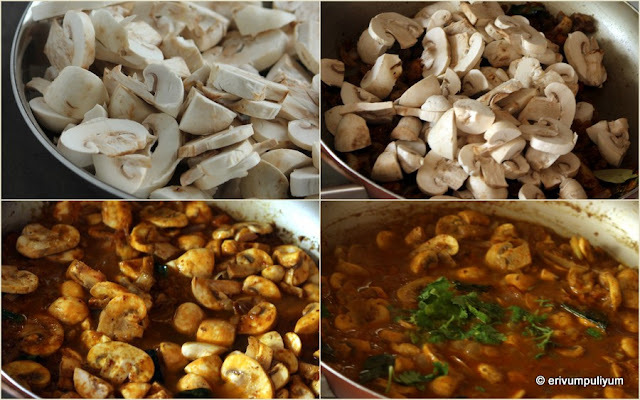 Chettinadu flavors are full of spices and they taste really delicious.I have already tried a few chettinad flavors(listed at the end) and we loved them all.This is another interesting recipe from chettinadu with mushrooms.This recipe is very quick to make if you have the ground chettinadu masala ready at hand.I had bookmarked this recipe sometime back but don't have the link of the source with me.The ingredients list may look long but the procedure is real simple and easy to prepare.The gravy is thick and well coats with the mushroom pieces.This serves as a healthy side dish with chapathis or steamed rice.Do try and enjoy !! Heat a pan and warm up the spices listed under 'to grind' except dry coconut and nutmeg on low flame.Switch off flame and add the dry coconut and nutmeg.Let it cool and then grind in a blender to fine powder without adding any water or very little water to make smooth paste(I didn't add any water and finely powdered). Wash the mushrooms quickly and wipe them dry with a paper towel.If the skin looks soiled and gently peel off the skin starting from the base and then cut them in thick slices.Keep aside. Heat a pan and add oil.When oil is hot,add the onions,shallots,green chilly and curry leaves.When the onion turns translucent and slightly browned,add the ginger-garlic paste.Saute until raw smell disappears,now add in the tomatoes.Cook the tomatoes until it turns mushy and comes together. Then,add the ground masala,turmeric powder and toss.Slide in the mushroom too.Combine well.Add a cup of water,adjust salt and cook covered for 5 mins.Then,check the consistency and add water if required.Simmer two more minutes and switch off flame.Garnish with coriander leaves/cilantro. * You can use freshly grated coconut too.In that case add with the spices and warm it up. * You can use cashews instead of dalia/pottukadala for a richer taste.Also skip adding dalia,if you don't like the gravy really thick as poppy seeds to the consistency. * This yields a moderately spicy curry.Increase/decrease spices as per tolerance and personal preference. 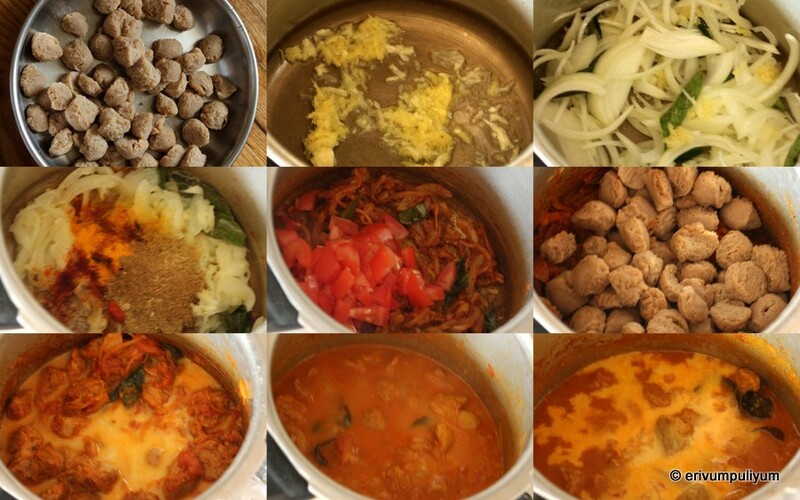 * Try to use all the spices listed so that you get the real flavors of chettinadu masala. * You can use the same chettinad masala to cook other vegetables other than mushrooms. Enjoy with chapathis/naan/ steamed rice !! 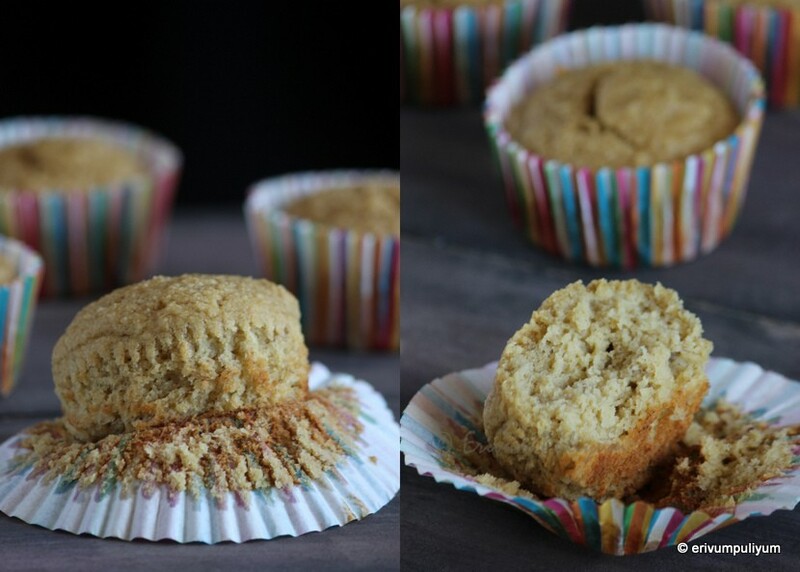 I had been looking out for healthy muffins for quite sometime now and my search ended in this post.It has all the healthy and yummy flavors,perfect for a filling breakfast or after school snack.These muffins uses almond meal and oats flour.They are soft muffins but lack fat content may that be of oil or butter.The original recipe calls for two bananas but I reduced as kids don't like banana flavors in bakes these days.But you can always add two or add in more milk like I did and so are slightly dry.They taste mild sweet but alter as per sweet tooth.These are perfect for all age groups unless you are allergic to almonds and can be served with a cup of hot coffee/tea/milk.My family loved this healthy muffins and is good for a change from the loads of sugar packed muffins.They can be enjoyed guilt free and almonds can be sneaked easily in this recipe.Do try and enjoy !! If you don't have ready made oats flour like me,then grind the quick oats in blender to get oats flour.Sift the flour,add in almond meal(I used blanched almond meal) and add in baking powder.Mix well. Mash the banana in a a bowl using a fork and add the eggs,whisk and add in vanilla extract. Pre heat oven to 350 degrees F/180 degrees C and line a muffin tray with paper liners. Now,start mixing the dry ingredients in the wet,mix to incorporate in batches.Add milk to make the batter in ribbon consistency. Add spoonful of batter in the paper liners until 3/4 th full.Place in oven and bake for 25 -30 mins or tooth pick inserted comes out clean. Cool on wire rack and enjoy with a cup of milk or tea !! 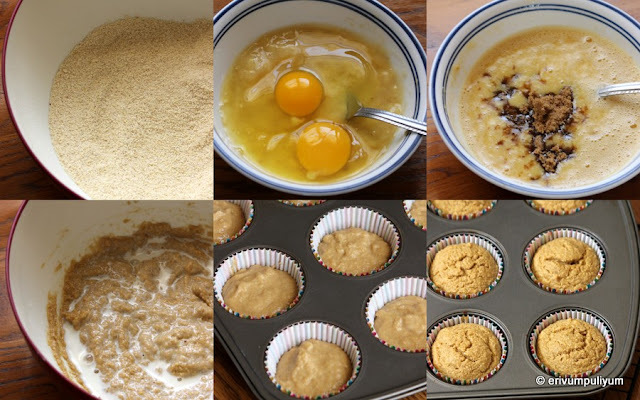 * The original recipe calls for agave nectar or honey but I used dark brown sugar.The amount of sugar used in this recipe yields mild sweet muffins so increase as per sweet tooth. 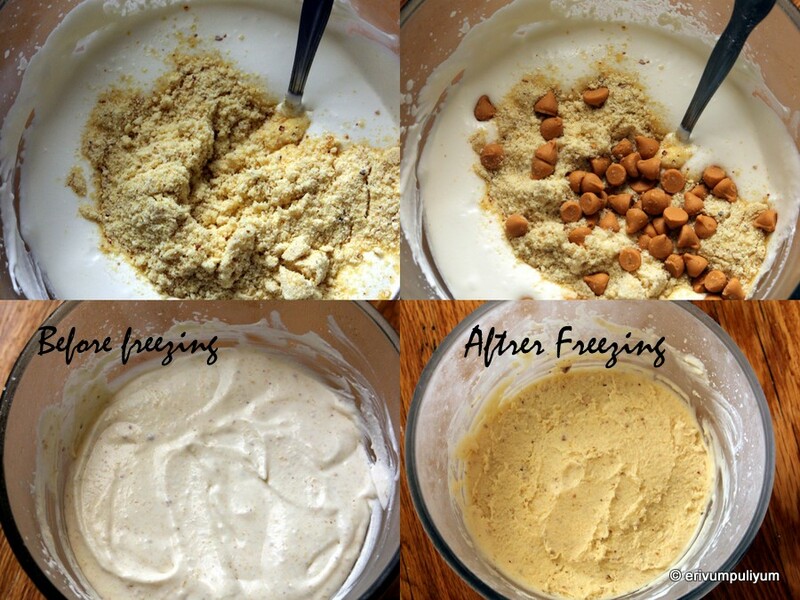 * For making almond meal,refer this link. * You can add almond milk instead of regular whole milk. * The original recipe calls for two bananas but I was apprehensive about dominant banana flavors so just reduced to one and increased the milk instead.You can use two but then alter the quantity of milk accordingly. * The recipe is adapted from here but slightly modified. * You can top it up with some nuts or rolled oats. For more muffin recipes,check this link. Summers are the best time for all ice creams,ice pops,smoothie,drinks and much more.Kids being at home these days demand all sorts of ice creams and ice pops.And in a way I feel relaxed and happy to make for them as by making this at home,I can be assured of the ingredients that goes in them and they love the homemade ice creams just like store brought.This is the butter scotch ice cream that we get in India.The ice cream has a natural light yellow color after freezing from the addition of caramelized nuts(I have omitted adding color but if you add a pinch of yellow,it goes to the perfect store brought ice cream) which I loved the flavor very much.The other day when I saw the recipe I couldn't stop trying this and all loved this very much.The biggest concern was to click pics before it starts to melt down.Kids had the ice cream in ice cream cones and my elder son's compliment was-'I had the best ice cream ever and a yummy ice cream treat too'.What else makes you a happy mom?? Do try and get ready to get all good compliments on your ice cream. 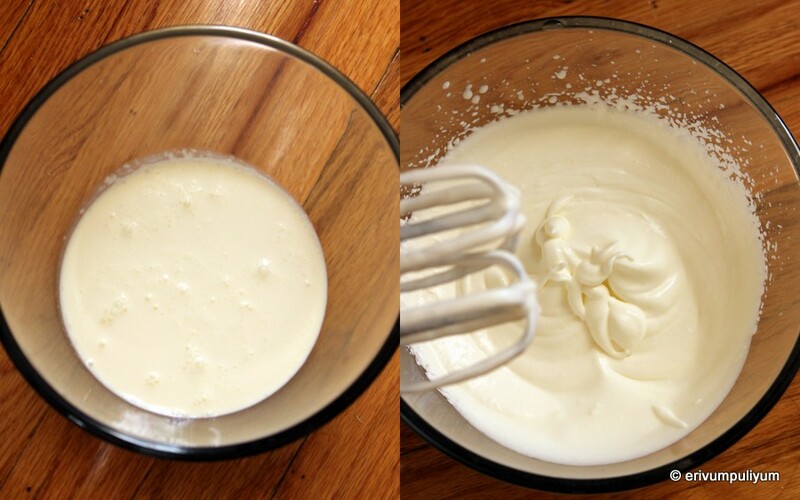 Place the bowl and in the freezer for 15-20 mins before you start whipping the cream.Add the heavy cream in the bowl and add powdered sugar.Beat until soft peaks.Add the butterscotch eesence or vanilla essence and milk powder.Mix well.Freeze for 2hours. 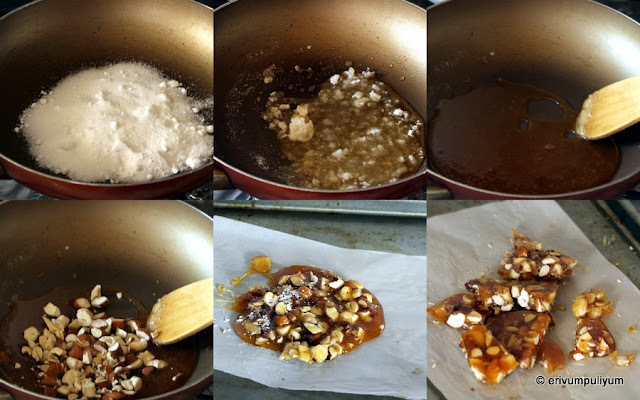 Heat a pan and add the sugar for making praline.In a tray,line parchment paper and keep ready.Wait till the sugar starts to dissolves,then using a spatula mix this well.Reduce the flame and wait till it turns golden brown.Add the roughly chopped nuts,mix well.Switch off flame and work quick to transfer the mixture to the parchment paper.Try spreading as much as you can and leave the rest just like that.Wait to cool down completely(it becomes hard like a rock).Break this in pieces and add to the blender.Coarsely powder the praline by just pulsing once or twice(Mine was more powdered so reserved a little praline to get the crunch and butter scotch chips complimented well but I feel the coarse powder and broken pieces does add a little crunch to the ice cream). Now,remove the whipped cream from freezer and add the powdered praline(reserve a small amount for garnish)and add butter scotch chips (if using)..Mix well and refreeze for 6 hours.Remove from freezer and mix well.Refreeze over night until nicely set. Garnish with few more butter scotch chips and powdered praline and serve chilled in ice cream cups/cones or serving bowls. * I used sugar but you can use condensed milk too. * If you wish to make the copycat of Indian version,add a pinch of yellow food color too.I omitted the color but taste wise its perfect. 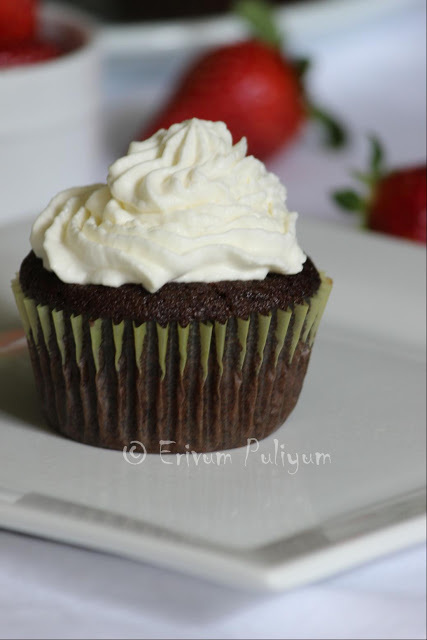 * The recipe is from here but tweaked slightly as per our tastes. Summer is going busy these days with kids at home and so I hardly get time to blog.Cooking is going on full spree.However,I make sure that I don't lose the enthusiasm as it becomes difficult to get back once I stop.Frankly speaking,there are only very few soya recipes that tickled the taste buds of my family and which they consider can replace meat in tastes.One among them was the soya fry recipe,veg kheema made with soya granules and soya cutlets.This recipe was a trial sometime back and was an instant hit.I love to call this curry as 'soya mappas' as the procedure is the same as we make chicken mappas or beef mappas.Now,this had taken over all soya recipes and tastes delicious especially with paalappam, vellayappam(kallappam) and even chapathis.This is a good option for all vegetarian and also to christian community esp during the lent period.This was abandoned in my drafts for over months now and was hibernating.Recently when other blogger friends posted soya recipes that's when I remembered this recipe.And here is how it looked and how I made.Do try this,am sure all would love this !! Wash the soya and add to a pan with enough water and bring to a boil.Cook until the soya chunks softens.Drain the hot water and add cold water.Rinse the soya 3-4 times to remove the smell and taste.Squeeze out the excess water and keep aside. Heat oil in a pressure cooker and add the ginger-garlic paste.Saute until raw smell disappears.Now,add in the whole garam masala and then slide in the sliced onions.Add curry leaves and green chillies too.Saute until slightly brown on medium flame(Add a pinch of salt to fasten the process). Add the spice powders on low flame and saute until raw smell disappears.Add in the tomatoes and mix well.Now,add in the cooked soya and toss well. Add in the randaampaal(2nd milk) or thin coconut milk,add salt and mix well.Close the cooker with weight and cook for 3 whistles on med high flame. Wait till the pressure is released.Open the cooker,and switch on the flame.Check the consistency and salt.Adjust salt if required.Add 1st milk(onaampaal) accordingly.I added 1/2 cup of thick coconut milk on low flame. Wait until one or two bubble appears at the edges and then switch off flame.Keep it covered. Heat oil(preferably coconut oil) in another pan and sliced shallots,curry leaves.Fry the shallots until pinkish brown.Switch off flame and pour over the curry. Serve warm after 20 minutes. * Freshly squeezed coconut milk adds a unique flavor to this curry and so I have used that.I used half cup grated coconut.But you can always use canned milk. * If you don't use coconut milk then,add whole milk 1/2 cup at the end like we add first coconut milk(thick).The curry will taste good. * You can add a cubed carrot or cubed potato along with soya to the pressure cooker to make it more rich.